2016 Eurobike will be held from 31 August to 4 September. During 5 days the entire bike sphere will be meeting in Friedrichshafen in Germany for without any doubt one of the biggest cycling events in the world. 3 days will be dedicated to professionals and 2 days to a festival that will open the doors of the show to all cycling fans. During the event will be awarded the Eurobike Award which can be compared to the Oscar for the cycling industry... Nothing but the best! The awards will be granted to new and innovative products, selected by a jury of experts. To designate the 2015 Eurobike Award, a group of 6 expert judges had faced some 500 registrations and had 2 full days to select the winners. The winning products were honored at the official Eurobike Award Ceremony and had been exposed to visitors during the show. 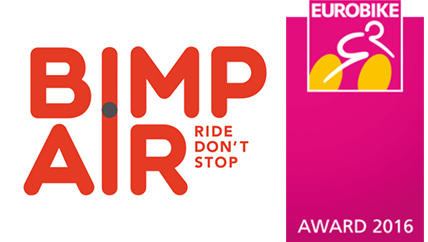 We are pleased and proud to say that the Bimp’Air technology was shortlisted for the 2016 Eurobike Award race! Very positive news that accompanies the launch on the market of our innovative nomadic air capsule, offering thus additional coverage and valuable guidance on the quality of the product at the time of purchase. We will receive the answer on 15 August; however this screening is already a testimony to the interest in the Bimp’Air innovation. We hope we can compete for the 12th Eurobike Award and who knows maybe win it! In the meantime you can find us on the show!